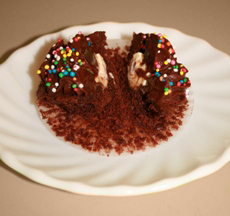 mud cake | Some More Please! This cupcake flavour was inspired by my favourite dessert at the Pancake Parlour called the “Alice in Wonderland” which is a pancake with a scoop of ice cream, hot fudge and rainbow sprinkles. This cupcake version starts with a chocolate mud cake base topped with dark chocolate fudge frosting and rainbow sprinkles. So what’s the surprise part you say? The pancake dessert has a scoop of ice cream, my cupcake has a surprise filling of thick, creamy double cream. 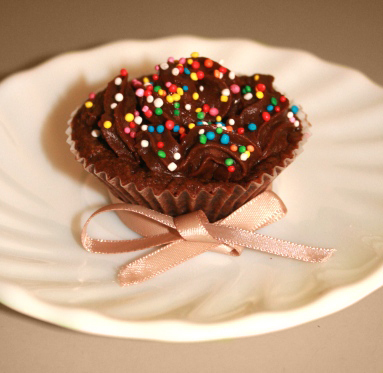 So I couldn’t post this cupcake without posting a recipe for the chocolate fudge icing! It is really easy to make and you can substitute the dark chocolate for white chocolate. Melt the chocolate, cream and butter in a heatproof bowl over a saucepan of boiling water and stir until smooth. Wait until the mixture is completely cooled and beat until it is light and fluffy.